Queen Creek AZ is a town in Maricopa and Pinal counties just south east of Phoenix AZ. The population on just over 26,000 has grown over 700% in the last ten years making it the 2nd fastest growing city in Arizona, and making it far more difficult to find people when you need to. This is where a profesional process server becomes essentional. The process servers of ASAP Serve will ensure the timely and accurate delivery of legal corrispondence in Queen Creek AZ. For fast and reliable document deliveries near you, contact the process servers in Queen Creek! ASAP Serve is speedy and professional and will get the job done right! When you need your divorce and family law documents delivered quickly and professionally in Queen Creek, contact ASAP Serve! We’re both fast, and efficient! When you need your court filings served, contact the excellent and efficient process servers at ASAP Serve! We do court filings, research, and much more! For reliable, fast, and efficient document deliveries for Arizona Prisons and other correctional facilities, trust the professional process servers at ASAP Serve! Do I Need A Queen Creek Process Server? A professional process server familiar with the legalities, jurisdictions, and environment of Queen Creek AZ can greatly improve the efficiency and speed of the delivery of such documents. ASAP Serve uses only certified and highly trained process servers to ensure that documents are served correctly the first time. The relatively small size of Queen Creek AZ should not lead the the assumption that legal process is simpler there than in a larger city. Every city has its own laws, regulations, and jurisdictions that a process server must know and obey to ensure the proper and correct delivery of legal documentation. Failure to follow these guidelines can result in considerable loss of time and effort. 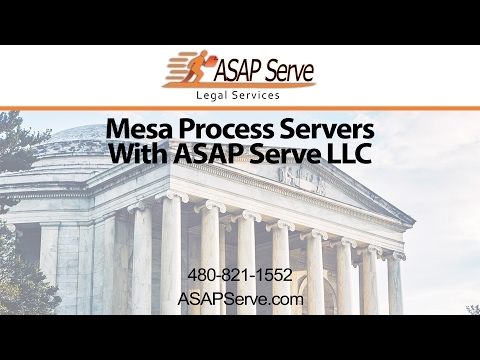 ASAP Serve process servers are very familiar with Queen Creek, and they are knowledgeable in all the vagaries of Queen Creek process law. ASAP Serve process servers will also ensure rapid delivery of process in Queen Creek AZ. Legal documents must be served within a very tight time frame determined by the court. Failure to do this can lead to a number of headaches ranging from the need to reissue the papers, to needing to begin the entire court process from the beginning, to potential loss of legal options entirely. ASAP serve will see your legal correspondence served on time and correctly.